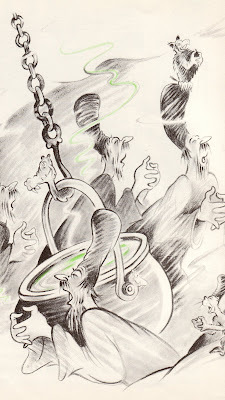 How did it take 30 years for me to reunite with the oobleck!?! When I was really, really little -- even before I could read -- I would pull this one off the shelf at the bookstore and freak myself out. I never actually read the book, but the pictures totally scared the crap out of me. I finally purchased it at a used book store a few days go and read it to my son for the first time yesterday. Man, did he dig it. I've never seen him more riveted by a book and jacked up. And frankly, I was pretty jacked too. This story is awesome on so many different levels that I could write a thesis about its awesomeness. Really, this just might be my favorite Dr. Seuss story EVER. For a moment they stood thinking, blinking their creaky eyes. Then they spoke a word...one word..."Oobleck." "Oobleck...?" asked the King. "What will it look like?" "Won't look like rain. Won't look like snow. Won't look like fog. That's all we know. We just can't tell you any more. We've never made oobleck before." There is this page boy named Bartholomew who -- even as the oobleck is hitting the fan and people are getting stuck in the muck -- pulls it together to give the king such an empowering tongue lashing... wow. The drama is impeccable, and the climax, as good as any I've seen. We've had three reads since yesterday -- "Mommy, where's the book about the gunk?" -- and mark my words, 20 years from now, this will be one of the ones that floats to the top of his memory, time and time again. A thousand thumbs way, way up. Love this book! If you want to make this into a kitchen/science experience, it's easy-my Science for Elementary Teachers class introduced me to it. Just mix corn starch, water, and food coloring, and you get some amazing Oobleck. It seems like a solid when you push on it in the bowl, but if you lift up a hunk, it drips like a liquid from your fingers. So fun! I've heard about this... i'm gonna have to check it out. i loved this book as a kid. i wonder if my mom (or me now) has this still... digging to ensue! You know about The 500 Hats of Bartholomew Cubbins, right? Same kid, same king (I think), slightly different lesson about pig-headedness. My dad would read it over and over to us. We also had a record of the Oobleck story, but I can't remember if it was a Disney record or what. Man, was that creepy! The scene where Bartholomew tries to get the king to apologize is kind of discomfiting in light of a recent TV series. To say nothing of the Reading Rainbow episode (which I just made up).